Experience a superior audio performance from the standard Toshiba SD-9200 DVD player. 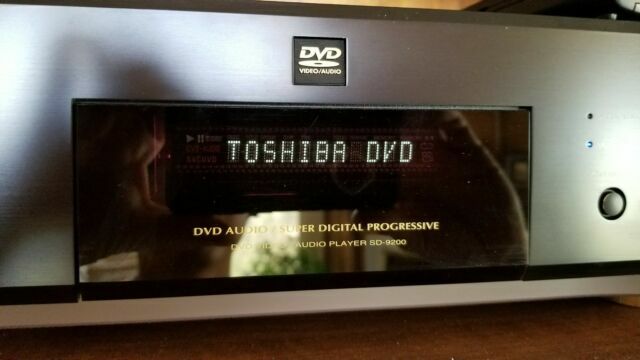 This Toshiba DVD player can play DVD videos, VCDs, DVD audios, CD (Audio), CD-R, CD-RW, and HDCD. This Toshiba 1-disc player features ColorStream Pro progressive scan for sharper and crisper images. Integrated with the Dolby digital decoder and DTS, this Toshiba DVD player ensures a high-audio performance. This Toshiba 1-disc player also features dual-channel and multi-channel DVD-Audio compatibility, for ultimate fun. Using the advanced audio DACs, the Toshiba SD-9200 player enhances your musical entertainment with its improved audio resolution, intensity and reproduction. This deck is the bargain of the century. I obtained it for $100 but they sold new for around $1500. It is rock solid and has many presets and color adjustments you can use to fine tune the video image. For example; it supports many different languages, and you can adjust the camera angle, image sharpness and contrast. I would enthusiastically recommend this player over Toshiba's more basic models, although they are an excellent value too. The SD-9200 supports CD, DVD-A, and HDCD formats. It features a copper chassis, polypropylene capacitors, and a shielded transformer. It has a sleek, minimal, elegant design. This is the only DVD player you'll ever need. The build quality was excellent and showed the colors of the movies in lifelike shades. However after using it for 2 months the transport started to become noisy and less than a week after that it will not play anymore. The panel shows "disc error". I tried all my dvd's but that is all it did. I tried to call some repair shops around and the answer was to replace it with a new models which nowadays are very cheap. I told them this particular machine was worth something when new (a high end audiophile equipment) but then again we live in a throwaway society so maybe I will just display this and look for something low cost but effective. Toshiba SD-9200 DVD Player "outstanding"! This unit is well made and heavy for a DVD player. Elegant in design, simplistic in layout of the remote. I have been frustrated with other DVD remotes of other manufacturers, not getting the functions to work logically! This unit surpases my expectations in features and quality.